Welcome to the 2014 edition of the Richmond Falcon Cam blog, and what we hope will be a good year for the Richmond peregrine falcon pair, despite a rocky start with both equipment and weather. 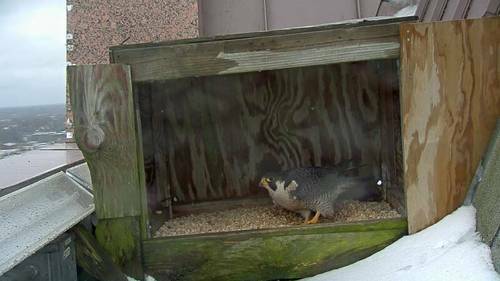 The Richmond Falcon Cam was recently replaced after it was determined that it had been malfunctioning. 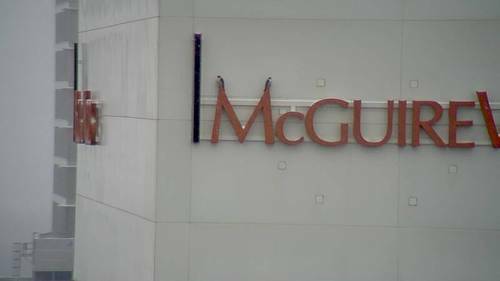 The new camera captures much crisper and clearer images and we are happy to bring these to you starting today; we appreciate your patience up to this point in dealing with often out-of-focus images from the old camera. Richmond has been beset by an unusual number of poor weather events so far this year, which may have contributed to the problems with the old camera. There have been snow drifts in and around the nest box on two or three occasions, and several unusually cold spells. And this brings us to the falcons. The female of the pair made her presence known to us through a casual fly-by as we were installing the camera on March 10. 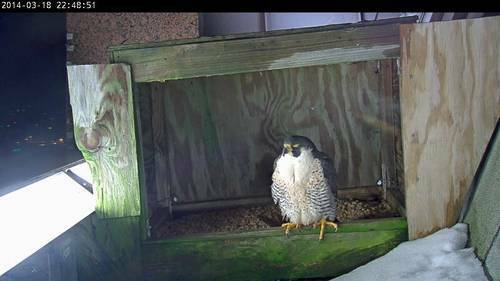 Since then, the pair has been seen together perched on neighboring buildings, and both birds have made individual visits to the nest box and its environs. The male was seen working on a scrape in the nest box gravel on March 16 – the scrape is essentially a depression in the substrate within which the eggs will be laid and incubated. Although it is the female that will ultimately select the nesting location, she has been regularly visiting the nest box since March 17 and was seen working on the scrape on a couple of occasions, all of which is very promising. 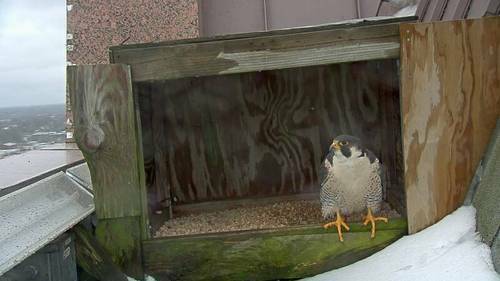 Falcons may nest at alternate sites within a territory, and this pair has attempted to nest on different downtown buildings in past years; however, the nest box on camera has been their most often used, primary nesting site. Has the poor weather resulted in a late start to the falcons’ nesting season? Snow accumulation within the nest box is certainly not conducive to nesting. But we cannot be sure whether the timing of the breeding to come would be different had the weather been milder. This particular falcon pair has been variable in the start of its egg-laying cycle: the date of the first egg has ranged from March 10 to March 24 in past years. At this point in time, the birds are still well within this 2-week range. As the Richmond falcons have encountered challenges during their nesting cycle in recent years, we are hopeful that this will turn out to be a good breeding year for the pair.